Electroacupuncture Fertility Treatment is a photograph by Thomas Fredberg which was uploaded on July 24th, 2016. MODEL RELEASED. Electroacupuncture fertility treatment. Acupuncturist preparing to apply an electrical current to acupuncture needles in a woman's abdomen. 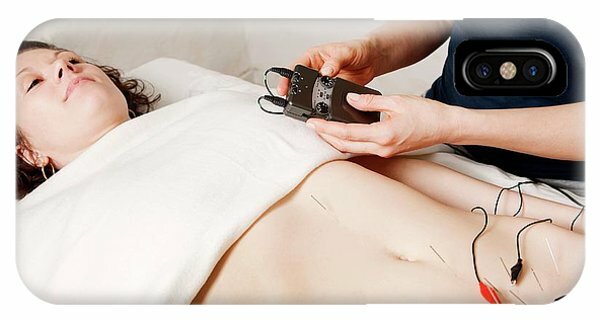 This treatment is a form of acupuncture that uses pulses of electric current. The aim here is to stimulate the 'conception vessel meridian' to treat infertility. Acupuncture is a traditional Chinese practice that uses needles to restore the energy flow through acupuncture points on the skin. It is used to relieve pain and to treat a wide range of disorders. Modern Western medicine explains the pain-relieving effects as stimulation by the needles causing the release of endorphins, the body's natural painkillers. There are no comments for Electroacupuncture Fertility Treatment. Click here to post the first comment.